We already know that the Great War did not “break out” suddenly and unexpectedly but had been wanted for quite some time by the elite of the European countries, that it was considered inevitable, that it was carefully prepared, and finally, that it was unleashed cold-bloodedly – with as pretext an assassination in Sarajevo that was not a real casus belli. The elite wanted and prepared the war in order to resolve once and for all the huge social problem to their satisfaction, that is, to chase away the spectre of revolution and to arrest the process of democratisation. At the same time, it was the intention to achieve objectives of an economic nature, that is, imperialist objectives, namely to conquer territories that could yield raw materials and labour cheaply, provided ample investment opportunities, and whose markets could be monopolized; and in these mostly distant lands one could also get rid of many restless and potentially dangerous elements of the lower classes. It was precisely this kind of factors which, in the spring of 1915, caused Italy’s elite to lead their country, in cold blood and with open eyes, into the war, even though the overwhelming majority of the population wanted nothing to do with the bloody conflict raging to the north of the Alps. In 1914, the Italian elite still found itself firmly in the saddle, but it had had two major reasons for concern. First, imperialist motives played an important role. The Italian elite realized that one of the two European sets of allies, either the Entente or the Central powers, would lose the war. Their colonies, and even some of their own territory, were likely to become available, and these spoils would only be pocketed by countries that were victors, not by those who had been mere spectators. Moreover, the gentlemen at the top of Italy`s social pyramid, apparently infected by a case of megalomania, believed rather naively that their country`s support would cause one of the two sides to win the war. If Italy stayed on the sidelines, it would surely gain nothing, but an investment in war seemed to guarantee major dividends – at least, that is what a growing number of decision-makers within the transalpine elite started to believe. It only remained to decide which set of allies would be the lucky beneficiary of Italy`s favours. From the Central Powers, the club of which Italy had been a member before the war, one could expect territorial presents at the expense of France and of Britain, such as Nice (Nizza), originally an Italian city, the birthplace of Garibaldi no less, that had been part of France only since the 1860s. Conversely, an alliance with the French and the British opened up prospects for the “liberation” of Italian-speaking regions of Austria-Hungary, such as Trentino and Trieste – morsels, just like Nice, of what was called Italia irredenta, “unliberated Italy” – and the Dalmatian Coast, where places like Spalato (Split) were inhabited by considerable numbers of Italians. From the Entente, one could also expect to receive as gifts bits and pieces of the huge Ottoman Empire. It was only shortly before, in 1912, that Italy had grabbed a piece of hat empire, namely Libya. This time Italian thoughts focused on the Aegean coast of Anatolia, especially the area around Izmir, and even on the Anatolian interior, for example Cappadocia. It was for those reasons that the country’s elite, on whose behalf the government functioned as a kind of executive committee, decided to go to war. But against whom, and on whose side? Negotiations were started with both sides, and finally it was decided to opt for an alliance with the Entente, because London and Paris promised more than Berlin and Vienne were able and willing to do. On April 26, 1915, a secret treaty was concluded in London, and on May 24 Italy declared war on the Central Powers. In the case of Italy, just as in the case of Japan, the entry into the war was thus obviously “motivated by imperialist ambitions,” as Max Hastings has observed. This is not one hundred percent correct, however, because the elite also had aspirations of a social-political nature, namely the ardent desire to halt and to roll back democratisation. The war the Italian elite wanted was not only a war of imperialist expansion, but also a war against democracy, against socialism, against revolution. The Italian elite was extremely worried about the fact that, thanks to the universal suffrage (for men only) introduced in 1912, the socialists had achieved much progress during the elections of 1913. These socialists continued to talk about revolution, and the revolution had seemed to be close to breaking out in June 1914, during the so-called “red week,” characterized by a wave of strikes and riots. And it seemed likely that very soon a major electoral victory might allow Italy’s revolutionary socialists to come to power and overthrow the established order. From the viewpoint of the country’s elite, the situation in Italy resembled that in France, Germany, etc., in 1914: it seemed that one had a choice between war and revolution, and that by opting for war one could prevent revolution. It was “war or revolution,” declared the Italian interventionists, “war on the frontiers [against an exterior enemy] or war in our own country [against an interior enemy].” It is therefore only logical that the decision to go to war reflected the lack of democracy and the elite’s hostility vis-à-vis democracy. In fact, the Italian declaration of war amounted to a kind of coup d’état carried out by the elite and orchestrated by the king of Italy in person, Victor Emmanuel III, the prime minister, Antonio Salandra, and the minister of foreign affairs, Sidney Sonnino. In other countries, for example in France and in Germany, the elite went to war in order to be able to put a stop to democratisation. In Italy, one can say that the elite had already arrested the democratisation process before war was declared – or that it arrested democratisation, that it eliminated democracy, in order to be able to go to war. But these are details of minor importance, because the consequences were essentially the same. Essential was that in Italy too, as in all belligerent countries, parliamentary life, reflecting a (modest) measure of democracy, was suspended for the duration of the war to the advantage of an elite that continued to monopolize all other power centres of the state. And, just as in all other belligerent countries, the transalpine elite also profited from the occasion to drastically limit the (modest) rights won by the trade unions before the war. Longer work hours were introduced, the right to strike was cancelled, workers could no longer change employers without permission, etc. In order to prevent social conflicts, committees of employers and union leaders were established, but if the union leaders were allowed some input de iure, they had no de facto influence whatsoever. However, in Italy too all sorts of unexpected problems arose. A “Truce of God” did not descend on the country, because in contrast to their comrades in Germany, France, Belgium, and elsewhere, the Italian socialists spoke out courageously against the war. Italy’s socialist party was the only socialist party to refuse to approve the war credits, and it maintained its opposition to the war from the beginning until the end. The Italian socialists, or at least the majority of them, remained loyal to the principle of international solidarity, they declared the war to be a crime, and they appealed to the proletarians not to go to war against the proletarians of other countries. In other words, they found themselves on the same wave length as Lenin. Benito Mussolini, editor of the socialist newspaper Avanti, but in reality not a socialist at all, at first also spoke out against the war. With the inhabitants of Lombardy, for example, the Sicilians had little or nothing in common. The majority of Italians were not (yet) Italians, they cared little where exactly the borders of their country were situated somewhere in the damp and foggy regions to the north, and they did not feel the slightest desire to leave their sunny paese in order to fight and die for the glory of the so-called fatherland. And they knew what was happening on the front in France and elsewhere and therefore did not believe what their “superiors” tried to tell them, namely that this war would be short, glorious, and triumphant. Among the recruits, consequently, no enthusiasm whatsoever was to be noticed. An Italo-American volunteer, who had just disembarked in Italy and traveled by train to the front, eagerly looking forward to martial adventure, was called a fool and a donkey by soldiers who accompanied him; it was the fault of imbeciles like him, he was told, that the war might last a long time. From the very start, the morale of the Italian soldiers was particularly low. The officers sought to remedy the situation by imposing an incredibly harsh, even draconian discipline. Severe punishment was meted out, even for the slightest peccadillo, and in the course of the war six percent of the men would be punished for some transgression. But that did not resolve the problem. Desertion wa a common phenomenon, even though it carried the death penalty. Officially, no less than 4,028 death sentences would be pronounced, a large part in absentia, as the perpetrators had managed to flee. In total, 750 Italian soldiers would be executed during the war: 66 in 1915, 167 in 1916, and 359, that is, more than half, in the catastrophic year 1917; but it is acknowledged that numerous executions also took place without the benefit of a formal trial. In addition, more than 15,000 men were condemned to prison sentences on account of violations of military discipline. Some of the convicted were still in jail in 1945, at the end of the Second World War! In order to discourage their soldiers from surrendering too easily, Italy’s political and military authorities made use of a particularly barbarous stratagem. They announced that they would not contribute financially, via the international Red Cross, to the care of their prisoners of war, as other countries did. To be taken prisoner, voluntarily or not, was considered to be a “sin against the fatherland.” The result was that tens of thousands of Italian POWs would die of starvation and cold in camps in Austria. Among the Italians too, a wide gulf separated the ordinary soldiers from their officers. The Italian officers were privileged with respect to accommodation and food. And the Italian generals likewise wasted thousands of lives in attacks against strong enemy positions. In October 1915, the aforementioned Italo-American volunteer witnessed on the front how officers emerged from their solid bunker after a breakfast including hot chocolate, toast, and even wine. They went to the observation post to watch an attack from a safe distance and remained unperturbed as wave after wave of their men were mowed down by Austrian-Hungarian machine guns. The volunteer was sickened by the indifference displayed by the officers. In the spring of 1915 the Italian elite hoped what the French and British elites had hoped in the summer of 1914, namely, that the war would be short and victorious. And, again like their French and British colleagues on the western front, the Italian generals expected that success would be yielded by an offensive strategy. 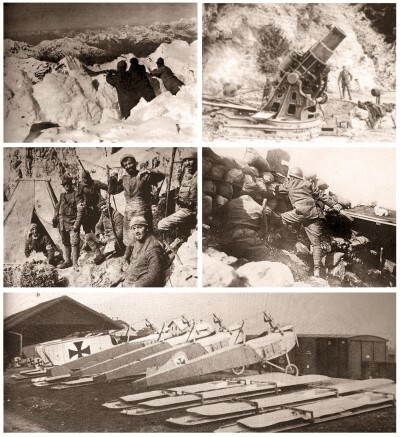 However, on the front in Italy, just as on the western front, the defenders, in this case the troops of the Danube Monarchy, enjoyed all the advantages, including the high ground, barriers of barbed wire, and weapons such as machine guns and artillery, against which the attackers proved to be extremely vulnerable. However, the Italian commander in chief, field-marshal Luigi Cadorna, scion of a prestigious aristocratic family from Piedmont, believed that, after the troubles experienced in 1914, the Austrian-Hungarian soldiers would be weak and demoralised. e dolente ognun si partì. And they were all sad to leave. e il ritorno per molti non fu. And most of them never returned. questa guerra ci insegna a punir. For this war you have to be punished. maledetti sarete un dì. The day of reckoning will come. e rovina della gioventù. You are the ruin of Italy’s youth. This is an excerpt from Jacques Pauwels forthcoming book: The Great Class War 1914-1918, to be published by James Lorimer in Toronto later in 2015.